The invention of the microwave is a fantastically simple concept. Microwaves have a frequency that can penetrated water, fat, and sugar molecules and excite them. For a molecule to be excited the electrons "orbiting" the nucleus have to jump up energy levels. When this occurs the atom starts to vibrate faster than normal. When this happens in a glass of water for example, all the atoms that make up water start to move and run into each other and create friction. When friction is created energy is given off in the form of heat. So if microwaves can excite the molecules in a substance and create heat, why not use them to cook food?! And that, is how a microwave works. There is a devise inside the oven that is the source of the microwave radiation call a magnetron. 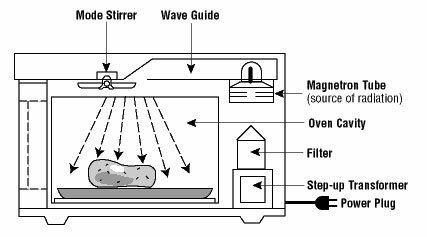 The waves than travel to the oven cavity through the wave guide and mode stirrer. The waves penetrate the food and excite the molecules. This is why the food heats from the inside out! Because the waves are literally creating heat on the atomic level of the food which in turns cooks the item inside out. So how come if you warm up a piece of pizza in the microwave for a longer than necessary period of time only some parts of the pizza burn? This is caused by the idea of "hot spots." Hot spots form because a microwave is sinusoidal, so it has peaks and valleys. Because of this the microwaves cannot excite all of the atoms at once. The results are hot and cold spots in the microwave. The picture on the right shows how microwaves look in a microwave after they have reflected of the oven walls for a period of time. The peaks and valleys represent the hot spots and the flat areas represent the cold spots. 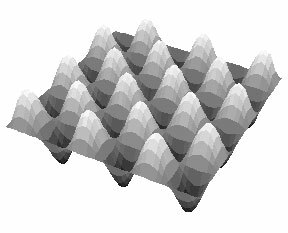 This occurs because the peaks and valleys have a stronger intensity and excite the atoms more quickly than the flat spots.